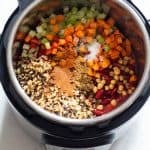 An Instant Pot Vegan Chili with amazing texture thanks to a secret ingredient. Super easy and extremely flavorful. A crowd-pleaser through and through. After all the experiments with a million Instant Pot Beans and already having an Instant Pot Chili with meat I figured it’s about time to create an Instant Pot Vegan Chili. I can’t believe I’m saying this but I actually think the vegan version is even better than the original. 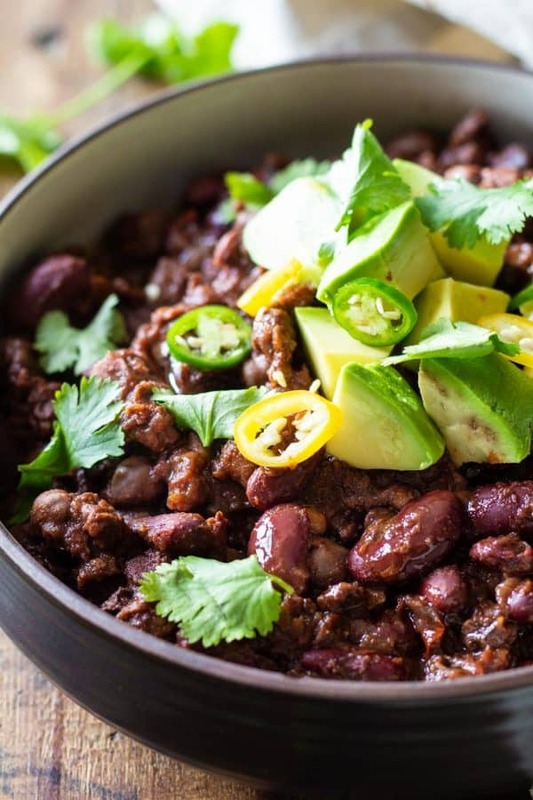 The flavor of the spices and beans are so much more dominant in this one and I love it! I recommend putting your dried beans in a big bowl, cover them with water and let soak on the kitchen counter for about 12 hours. 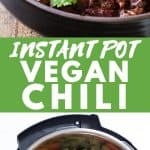 Does Instant Pot Vegan Chili Freeze Well? YES! Very well actually. I’ve tested freezing and reheating and it’s perfect for freezing. The best part is you can even defrost it in the instant pot again. Just freeze it in a round shape so it fits as a frozen block in the pot and you’re good. To make that happen you can just use a freezer bag and add it to a bowl or container that would fit your instant pot and place in the freezer. That way it freezer in the right shape from the beginning. To defrost you just add the block to your instant pot, add about 1/2 cup of water or broth and set it to 5 minutes on high pressure and that’s it. It will take a while to come to pressure but it’ll get there eventually. Alternatively, you can let it defrost in the fridge and then reheat in a regular pot or microwave. I prefer this option actually because I feel the liquid reincorporates into the food and the flavor is better, but I’m not always as organized so using quick methods is defo something I have to rely on every once in a while. Beans and legumes have quite a bit of carbohydrate so I like to keep it carb free when it comes to sides for chilis with exception of maybe a piece of bread. 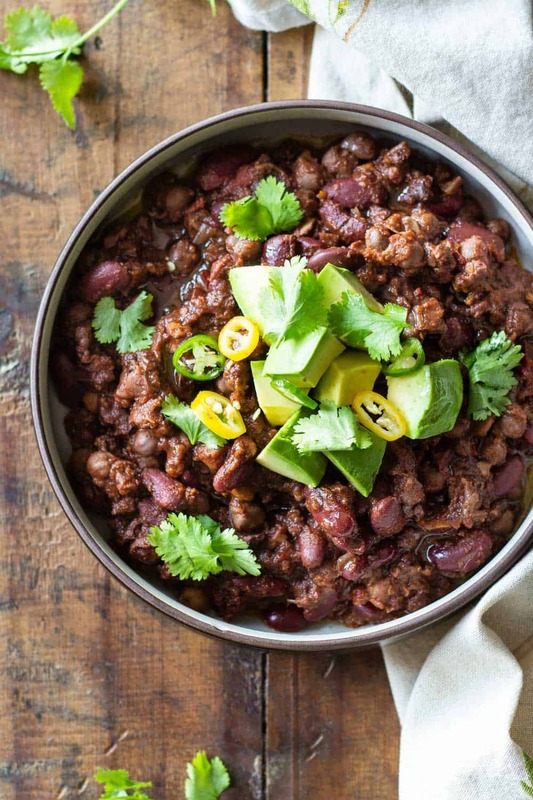 My favorite way of eating chili is just like that and topped with fresh avocado and cilantro. The combo is unbelievably good! You can most definitely serve this over rice, too if you like though. It tastes amazing with rice. Soak chickpeas and kidney beans 12 hours or overnight in abundant water. Then drain and rinse. Press the sauteé button and once hot add a dollop of oil to it. Fry chopped onions and crushed garlic in oil until soft, then deglaze the pot with a splash of water (see video). Add fire-roasted tomatoes, drained and rinsed legumes, diced vegetables, chopped walnuts and all spiced and fill in water until all legumes are just covered. Stir everything well together, put on the lid, turn the valve to the sealing position and set to 25 minutes on high pressure. Let pressure release naturally completely. Meaning, don't touch the pot until the safety pin drops on its own. Open the pot, give all one last stir and add more sea salt and pepper to taste if necessary at this point and serve. Top everything with cubed fresh avocado, cilantro leaves, and sliced chili if desired. 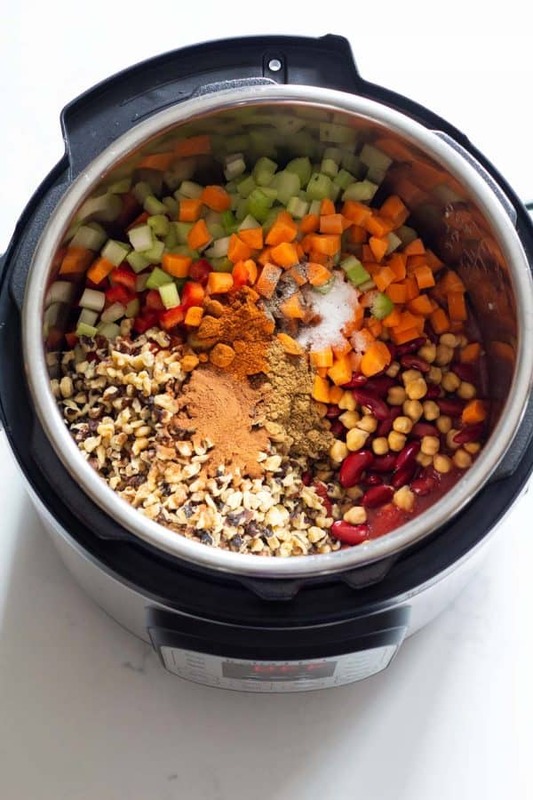 This recipe looks wonderful and I’m eager to try it when my new Instant Pot arrives today. I’m getting the 6-quart pot… will that be big enough for this recipe? Last night I made this chili in my 6 quart instant pot. Well, I made a modified/merged version of this chili. I got my instant pot as a gift and this is the first dish I made in my pot. 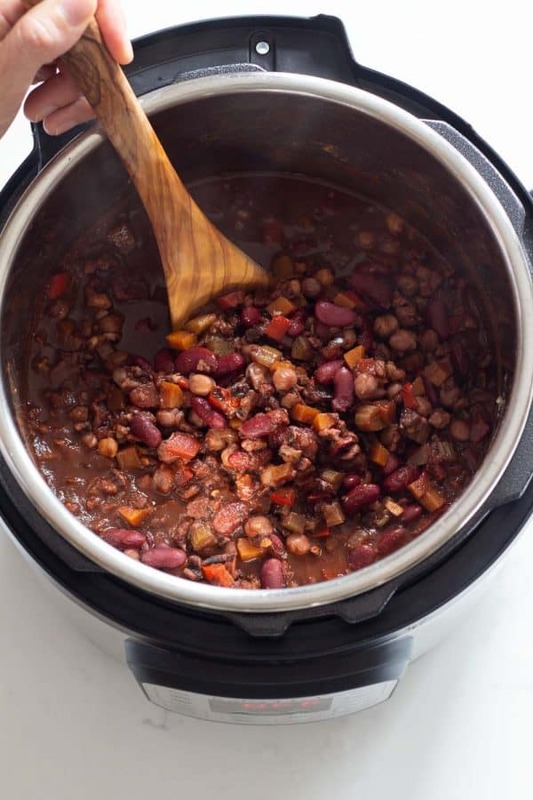 I crawled through YouTube looking for a vegan chili using dry beans and an instant pot. To me, your video and article are the most clear. Your video is so quick, yet packed with all the instructions and even some tips. And your chili has the best visually appealing look on the final presentation. My finished beans came out perfect, intact yet creamy in the inside. I purchased from my local Ross store a box of Veggie Bean Soup – by the brand Buckeye Beans and Herbs. It’s 12 0z of beans and that’s what I used in place of all the beans you listed. The box instructions call for 4 hours of stove top cooking. In the same amount of time it took me to make the corn bread, the beans were done. Amazing little pot! My beans were presoaked in cold water on the counter for 3 hours and in the frig for 3 hours with a little salt and baking powder for 6 hours total. I added a tiny can of jalapeños and a bag of beyond meat crumbles. I used all the ingredients listed in your recipe in addition to the little packet of spices that came in the Buckeye box. I did leave off avocado and cilantro, they do not digest well for me. And I somehow didn’t see the cinnamon listed. I used the bead/chili preset button on “less” which took 25 mins. I took a few more liberties, once it was done I did a quick release and added frozen spiral zucchini and butternut squash (also added the frozen crumbles in at this point) and set it for 1 min pressure high. It gave me an error message of “BURN” after some time, but it wasn’t burnt. Oops, forgot to deglaze. The veggies were still stiff and not mushy, which was my goal so I set the pot to “keep warm” and started taste testing. I’m obviously still learning how to operate this pot. I sent a large amount of chili with my husband to his job along with some cornbread muffins. Today’s weather is windy, cold and rainy and the chili was well received. He said it was all gone within an hour. There are many vegans at his job, so I was glad they could enjoy this dish. The walnuts are my favorite ingredient. Very clever secret ingredient you use. I’m taking the rest of the chili to my job tomorrow and I know my coworkers will “oh and ahhh” because they love to eat! l really appreciate your video and the blog article is so helpful. People always ask for the recipe, I’ll be sure to send your link. Thanks! Very tasty! I love the texture with the beans, veggies and walnuts. I used Tajin instead of cinnamon. Next time I will add a can of diced chilies.